From infancy, children learn by watching and imitating adults. Even when adults show them how to open a latch or solve a puzzle, for example, children use social cues to figure out what actions are important. But children read these cues differently depending on their age: Older children, interestingly, are more likely, not less likely, to faithfully imitate actions unnecessary to the task at hand, reports Cornell research. The findings imply that children of different ages have different expectations when they watch and learn from adults, based on their growing social understanding, say authors Yue Yu, graduate student in the field of human development, and Tamar Kushnir, the Evalyn Edwards Milman Assistant Professor of Child Development in the College of Human Ecology, in a study published online in Developmental Psychology (Aug. 26) ahead of print. “Understanding what causes children to imitate in any given situation, and especially to imitate actions that seem to have no obvious purpose, sheds light on how children’s minds work and what influences their learning,” Kushnir said. To explore how age and social context influence children’s imitation behavior, the researchers conducted two experiments with 2- and 4-year-olds. In one, children played one of three games with the experimenter (copying the experimenter’s hand gestures, taking turns to find and fit a puzzle piece, or a non-interactive drawing game). Then, they played a puzzle-box game after watching the experimenter show two actions on the toy and retrieve a puzzle piece. In half the trials, only the second action was necessary to recover the puzzle piece. The researchers found that the 4-year-olds faithfully imitated both necessary and unnecessary actions to get the puzzle piece, regardless of the game they played beforehand; 2-year-olds, however, were heavily influenced by the context set up by the prior game. They were more likely to faithfully imitate unnecessary actions after playing the copying game and more likely to selectively emulate just the necessary action after playing the puzzle-solving game. A second experiment ruled out the possibility that the 2-year-olds were merely primed to copy anyone – their strategies were not influenced by the copy game when they played it with a different experimenter. This suggests that toddlers in the first experiment were actively engaged in a social interaction with a particular individual from which they inferred goals for the following game, Yu and Kushnir concluded. Their findings underscore the important role that children’s developing social knowledge plays in what and how they learn, they said. 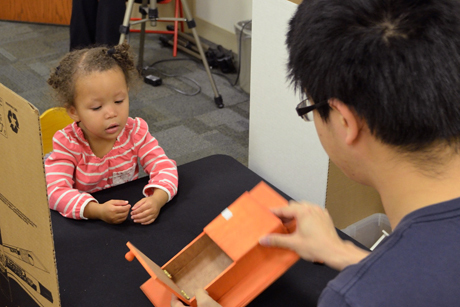 When toddlers watch adults, what they pay attention to and imitate appears highly dependent on the context and expectations set up by the adult, and this points to the importance of establishing rapport before trying to teach them something, said Yu. Preschoolers, on the other hand, are more likely to view all adult’s purposeful actions as part of the social interaction, perhaps even as social norms, and thus imitate them as faithfully as possible. This enables imitation to be a source, not just for learning about objects (e.g., how a latch works), but for rich and accurate cultural transmission, Yu added. Or for embarrassment, depending on what you just demonstrated in front of your preschooler. The study, “Social Context Effects in 2- and 4-year-olds’ Selective Versus Faithful Imitation,” was supported in part by the National Science Foundation. Karene Booker is an extension support specialist in the Department of Human Development. Posted in Features and tagged child development on January 23, 2014 by ktb1@cornell.edu.